Discipline #2 – Act on the lead measure. Discipline #3 – Create a compelling scoreboard. Discipline #4 – Create a cadence of accountability. Each team needs wildly important goals (WIGs). Because team focus is quickly diluted, it’s important that ministry departments and teams have no more than 1 or 2 WIGs at the same time. While it’s fine to have sub-goals or sub-WIGs, they must ensure the success of the parent WIGs. WIGs should be measurable and have a clear finish line (E.g. from x to y by when). Worship WIG – Increase Worship Attendance and Engagement to 2,311 by 8/1/19. Community WIG – Increase LIFE Group Attendance and Engagement to 1,302 by 8/1/19. Service WIG – Increase Missions Volunteers and Engagement to 630 by 8/1/19. 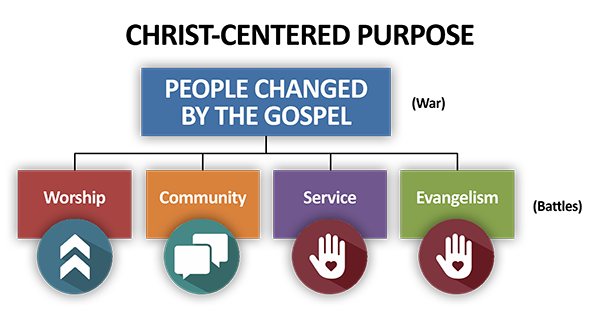 Evangelism WIG – Increase Baptisms and Salvation Decisions to 125+ by 8/1/19. Goals help us focus on important and strategic things and move beyond the whirlwind of day-to-day activities that consume most of our time and energy. Whirlwind – The urgency of the day to day. Urgent – It acts on you. Important – You act on them. S = Specific – They should target a specific area for improvement. Exactly what do you want to accomplish? Who, what, when and where? M = Measurable – They should quantify or suggest an indicator of progress. How will you track your progress? How much and how many? A = Achievable – They should aim for a realistically achievable result. Do you have what you need to achieve your goal? Is your goal too challenging? Is it too easy? R = Relevant – They should be goals that matter. Is your goal aligned with organizational vision and values? T = Time-Bound – They should specify when the result can be achieved. When will you achieve your goal? What is your time limit? Use a short form Ministry Action Plan (MAP) to make strategy and goal-setting purposeful and concise. MAPs are vision clarification and strategy planning on a few sheets of paper and the goal is K.I.S.S. : Keep it short and simple.